Michelle Black 's An Uncommon Enemy is the first out of three books in a series entitled "Mysteries of the Victorian West" featuring Brad Randall and family. 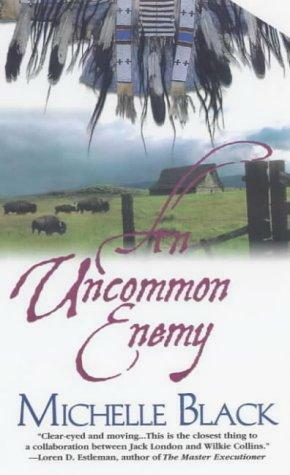 An Uncommon Enemy takes us back to the days of General George Custer in fall of 1868. Eden Murdoch is a white woman living among the Cheyenne indian tribe, captured by Custer when his men invade and attack their village. As Eden mourns her slaughtered Cheyenne family, she befriends Captain Brad Randall and opens up to him about her life with the indians and the story of how she came to live with them over four years ago. Michelle Black paints an eerily accurate picture of Custer and his men and bases An Uncommon Enemy on true events; specifically on the discovery of a mysterious white woman described in Custer's old journals. The novel is an all-around good story if you're in the mood for some entertaining, yet well-written literature. Even if you're not typically a fan of westerns, An Uncommon Enemy falls into the category of historical fiction. The novel does not feel lengthy by any means, but I wish it had had more depth! Eden's character reminds me a lot of Clare Randall in the "Outlander" series by Diana Gabaldon . This is due to the vastly different living conditions Eden is thrust into when she is separated from her Cheyenne family and how she learns to cope as she secretly plans her escape. I regret to say that although An Uncommon Enemy is an enjoyable read, it doesn't move me much in terms of emotions. The novel passes the time, but may be unforgettable as time passes. It's a rare occasion when I review a book and have nothing much to comment on about it! Nevertheless, I am looking forward to reading the rest of the books in this series, which include Solomon Spring (2002) and The Second Glass of Absinthe (2003).